BANGI, 5 May 2014 – Water tariffs in the country should be raised to realistic levels to deter the public from wasting water even though Malaysia is among those countries receiving the highest rainfall in the world,. A researcher from Universiti Putera Malaysia (UPM) Dr Haliza Abdul Rahmansaid consumers should not be taking piped water for granted because it is in short supply because of climate change as well as wastage and leakages. 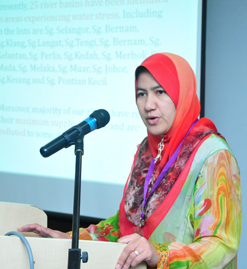 Presenting her research findings at The 4th Conference on Human Habitat and Environment here today, Dr Haliza said the average Malaysian consumes 226 litres a day, which is way above its South-East Asian neighbours – even higher than Singapore which is far wealthier than Malaysia. Malaysians should thus be taught that supply of water is not limitless, she said. The problem is Malaysians see water as something cheap compared to other essential utilities as the water bill for the average household is only 10% of the electricity bill because the tariff is the lowest in the region. The problem of wastage is further complicated by aging infrastructure, as most of the water pipes are archaic and had been left unrepaired for decades. It is estimated that more than 36% of the water is lost through leakages. She acknowledges that politics is also a factor in having low rates for water, such as the Selangor State Government giving the first 20 cubic metres of water for free. Dr Haliza said the recent drought and water shortage had highlighted the basic problem that the supply had not increased in the last few decades though demand had risen by 4% annually. The dramatic increase in urban and suburban population had put further pressure on the suppliers, which in Selangor had seen water rationing lasting for three months recently. Asked about the lifting of the water rationing in Selangor on April 30 despite water reserves in reservoirs being still below the 60% capacity for sufficiency, she admitted that it came as a relief to her. “As a consumer, I want my water supply to be regular, constant and not interrupted,” she remarked. However, it takes discipline among members of the public to help resolve the shortage, something that cannot be realised without enforcement. She said strict laws on wasting water cannot work without the necessary enforcement. She also proposed the water companies repair or replace the old pipes and use less water for agriculture. She estimated that by the year 2030, half of the world’s population could face a water shortage due to climate change. Dr Haliza is associate professor at the Department of Environmental and Occupational Health, Faculty of Medicine and Health Sciences, in UPM. The two-day conference, which brought together 30 researchers from public universities, was organised by the Institute of the Malay World and Civilization (ATMA), the Centre for Scientific Research and Sustainable Governance (SGK) of The National University of Malaysia’s (UKM) Institute For Environment and Development (LESTARI) and the Environmental Management Society (EMS).